We’ve established that West Coast gets an average of around 4 net free kicks when they play at home. This means that the Eagles get 4 more free kicks in their favour than their opponents. 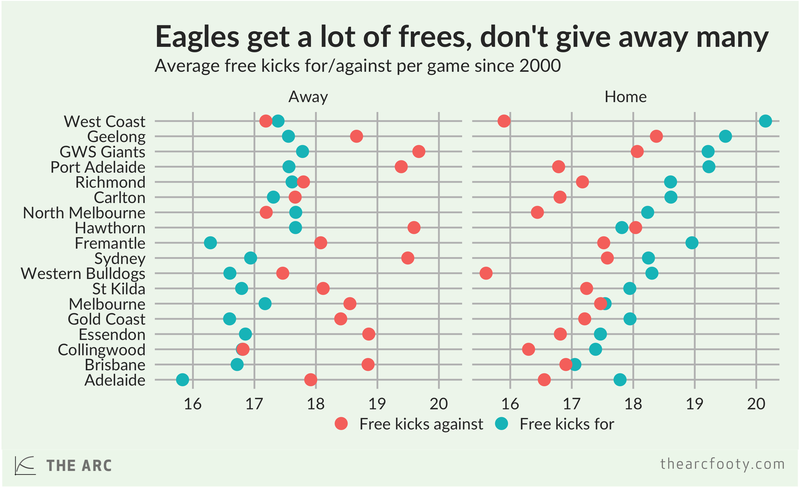 But is this because the Eagles are given a lot more free kicks, or because they concede fewer frees to the opposition? It turns out that the answer is both. The Eagles get an average of over 20 free kicks in their favour in home games, the most in the league, while conceding fewer than 16 per game, the second lowest in the league. The Eagles are also one of only two teams (the other being North Melbourne) that comes out ahead on free kicks even when they’re playing away. That surprised me, as you’d think the Melbourne-based clubs would have a fair number of supporters at many of their “away” games. Of course, all the free kicks that the Eagles are awarded could be entirely deserved! Unfortunately, the data we’re using don’t tell us whether the free kicks were deserved or undeserved. As an Eagles fan, I choose to believe that they’re all entirely justified. Previous article	← How old is the typical Premiership team?